Adrian Walker - also "Birds of Mission Beach"
The whisperer receives numerous callouts to the vicinity of chook sheds as these act like magnets to hungry snakes. One such call recently was however, something of a treasure and worth relating to the wide and discerning reading audience of the CCNews. A gent phoned one morning to advise that he had sighted a large, sleeping Python nestled cosily on an upright pole in his neighbours shed. Politely, I enquired as to whether the serpent was causing any problems? He explained that his neighbour was on holidays and prior to leaving had informed the caretakers of a steady decline in his chicken population - he estimated this to have been 3 in 6 weeks, altogether a significant loss of egg production. The neighbour had thanked him for this information and then, a few days following the neighbours departure, a further chicken had miraculously gone AWOL! A visiting Python was obviously suspected but the rogue take away specialist had maintained a discreetly low profile. At least until this morning! The whisperer arrived at the small, slightly out of town cottage to be met by the caller and his father, a splendid man of white hair and good manners towards snakes - he had insisted I be called rather than meting out any harsh bush justice. The culprit was shown to me and indeed looked supremely comfortable atop its wooden post in a shed conveniently adjoining the chook house. No difficulties with decision making at tea time for this 4M Amethyst Python, just wait until lights out, then the chicken of your choice, served without sauce of course, but nonetheless delicious and better still, free! An offer too good even for the Colonel! Sadly, our 4 metre long friend was in the bag before you could say 'Fancy chicken for dinner tonight?' and duly deposited a sensible distance removed from the shed which had given this serpentine take away addict such pleasure for a few months. Don't forget the whisperer's book of snake tales will be launched this March 20th at Mission Beach Visitor Centre, 4 p:m sharp! Be there! The whisperer rarely encounters Taipans but of course all things tend to balance out over time and this past week has surely been devoted to Timmy's! First off was a call from a shop in North Mission where the staff had been alarmed by the sight of a snake skin of considerable dimensions. The whisperer agreed to an identification visit and having viewed the freshly shed 3M skin concluded the previous owner had indeed been a Taipan, albeit one who was unconcerned at the loss of an old skin. This was number one and a snake that I was unable to find on the day yet would hear a great deal more of in the days ahead. Within 48 hours the Taipan skin had miraculously stretched to 6M and then a further 48 hours lapsed before I received hearty congratulations from a local gentleman on CATCHING the 10 METRE TAIPAN that had been terrorising the community. Mission Beach certainly has a Chinese Whisper scheme going that rivals the best!! Whilst still in chuckle mood over the remarkable enlargement and resuscitation program this skin had undergone I received another call, one more chilling. 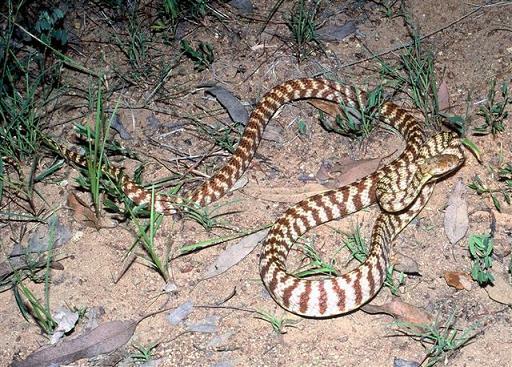 A gent not far removed from the coastal strip had lost a healthy dog to a snakebite that bore Taipan hallmarks rang to request the whisperer to crawl around his house and determine whether the culprit remained in situ. One problem immediately presented when he explained that his home was raised a mere two feet above ground level. Nothing quite excites the whisperer as much as the possibility of crawling around in an extremely limited space searching for one of the world's most venomous snakes and with this in mind a firm NO THANK YOU was delivered with appropriate explanations to the saddened home and dog owner. Until Taipan numero trio appears may the whisperer wish all his readers a jolly Christmas, prosperous and cheerful New Year and may the Taipans avoid you all. Snake whispering is generally a pleasant pastime, despite its reptilian connotations and the fact that many people are downright terrified of these usually harmless fellow travellers. Thus I read with interest in the Cairns Post recently that reptile removals thereabouts cost somewhere between $60 and $120, substantially more than the Mission Beach whisperer charges his clients. However, as I don't regard it as a commercial operation but more a welfare service for the snakes concerned and hopefully an educational experience for the humans involved, my meagre fees seem justified. Another intriguing scenario confronted the whisperer recently when he was summonsed to remove a moderate sized Python from a kiddies cubbyhouse, also situated in an expensive home with pleasant beach views. The snake was not of a mind to be relocated and accordingly quite aggressive but nowhere as confronting as the enraged man of the house who made a special point of phoning the whisperer to abuse him for charging what clearly should be a FREE community service. A careful explanation of how his wife KNEW there was a charge involved was dismissed as 'she was too emotional to know what she was saying' and a final demand for a Tax Invoice, presumably to tease the ATO with a curly question... is snake removal from the kiddies cubby a legitimate deduction? One will leave this to the financial experts to determine whilst one will also add a certain property to the blacklist. 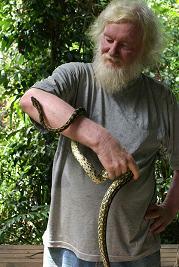 As he said, "if I'd have known you charged, I would have done it meself"
With a cranky Python?? I'd like to see that! Whispering at reasonable rates is still available and watch this space for further exciting news - Phone 40687531 or 42221118 AH. The whispering business has been quietly of late indicating that maybe the good folk of Mission Beach are becoming more relaxed about a reptilian presence around the home. A whisperer can only hope? Thus a Sunday night callout for a HUGE python comes as a mild surprise. 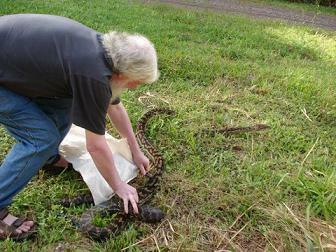 Not so mild upon ones arrival however when a genuinely large snake is indeed encountered. This magnificant specimen is close to 6m in length, nearly 30kgs in bodyweight and superbly healthy, Mike Tyson wouldn't stand a chance! As the big boy is threatening to devour a few passing cars along Marine Parade it is deemed wise to relocate him to a less settled part of the beach which is accomplished fairly swiftly. Sunday nights may never be quite the same though! Whisperer is available on 40687531 or after hours on 4222 1118 - now don't forget those numbers as the season is just starting! Now whispering must never never become shouting but laughing out almost loud is definitely permitted and such an occasion was to bring mirth to the whisperers life this week. An early evening call from a frantic woman in Carmoo advises the whisperer of a Taipan in her toilet. He embarks into the bold, red Snakewagon and sets forth at a reasonable pace without breaking limits anywhere. Upon arrival I am greeted by a wild-eyed woman and her calm daughter of about fifteen or sixteen. It is the latter who shows me the loo door and apologises for the bulk of the family library being stacked up at the base of the door. Following the careful removal of numerous copies of War and Peace, illustrated Bibles and other assorted coffee table items I am able to gain ingress to the smallest room, there to be confronted by a 25cm Brown Tree Snake, somewhat as expected. I have begun to refer to Brown Trees as "Tully Taipans" - the reasons should be clear. Having bagged the culprit and thus enabled the family the respite of visiting that much used room the homeowner asks why the snake came in? Normally this is an imponderable query as to get into a snakes head is not an easy thing. In this case however, clues exist. Sherlock Holmes could have left this case to Dr Watson! I realise that the seat is perhaps her pride and joy so refrain from any mention of it but do point out that the froggy decorations are better below the window, maybe on the vanity basin? She listens carefully, smoking heavily and quaffing Scotch in gulps whilst her daughter pats her ina reassuring manner. August already and the whispering business is as active as ever! Mission Beach’ snakes haven’t been told of the northern winter or disregard it completely! A breakfast interruption proves to be a two and a half metre Amethyst Python perched lazily atop a roof in downtown Mission. This temporary resident is attracting a great deal of attention from the caravan park dwellers next door and quickly proves to be in an ugly mood, baring teeth and lashing at the hand which arrives to move it to a more relaxing location. For this elevated task the cautious whisperer has sent forth his new apprentice! 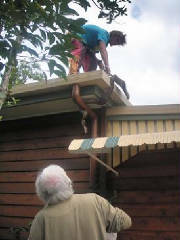 Tools are clearly called for so a broom is relayed to the rooftop and the full stomached reptile gently eased from his seaview perch to a nearer the garden situation where he is carefully bagged amidst applause from the gathered throng of tourists who will have some tropical tales to relate when they get home! One imagines the serpent may be 5 metres long when the saga reaches Sydney, 6 in Melbourne and substantially longer by the time an Adelaide home base is attained. Normally the collection is followed by a quick release in a safer location and a similar journey was planned for this little chap, a nice bushland setting well removed from main road traffic and somewhere to digest the uncomfortable looking meal. However, this plan is partially thwarted at the release point! As the Python tumbles forth from the bag the whisperer is struck by a curious blackened piece of debris that also emerged from the bags innards. An inspection reveals the stiffened body of an adult male Black Flying Fox, an altogether overly large meal for a comparatively small snake! Instantly the bad temper on the rooftop is explained by the fact this reptile had simply swallowed something bigger than it could reasonably digest, an old adage the serpents grandmother had surely passed on to this callow youngster! Lesson learnt and Fruit Bat regurgitated the Python slithers happily off, presumably in search of a more digestible meal! The whisperer is available on 4068 7531. Snake whispering remains on high alert this spring as reptile movements are frequent and they are turning up in all sorts of odd places! Following a brief holiday away from the Beach the Whisperer returned to a clutch of calls including a pair of large Pythons. The first was an out of town number who had apparently made a determined effort to devour a young lady's pet Cockatoo earlier in the week. Despite her heroics in rescuing the Cocky the felon had returned and taken up residence upon a window sill, perhaps waiting for 'lights out' to move in and snaffle the hapless bird. This particular Python must surely have been well schooled in the old "if at first you don't succeed..... " adage. The owner of both home and bird was sufficiently concerned by the size of the beast and the awkward height it lay awaiting to call the whisperer. A brief nocturnal struggle followed with the final score being whisperers 1 vs Pythons 0! A not uncommon result. The offender was duly relocated to East Feluga Rd. where one can only wish it good hunting and bon appetit. The next day arrived with an after lunch treat turning up in Mission Beach, also eying off a henhouse full of tasty looking chooks and near a home where Mission Beaches' best known Cockatoo resides when not strutting around town on it's owners arm. Again, a sense of urgency prevailed and the whisperer was at the scene of the intended crime in good time. This specimen proved to be a 4.3M beauty which displayed considerable reluctance to be placed inside a bag! Understandable enough one supposes? The homeowner dropped the bag on a first attempt but fortunately an able grader driver was quickly at hand with both camera and first class bag holding skills, thus eventually ensuring a successful outcome with an identical scoreline to that of the previous night. Clearly the Aussie cricket team must be developing an attitude of envy towards the whisperer as his results continually outperform their tragic Indian tour! This individual was relocated to Boyett Rd. where a diet of Bandicoot or White-tailed Rat was prescribed as a satisfactory alternative to choks or Cockatoos. Snake relocations can be arranged by calling 40687531. A whisperer never quite knows when something truly remarkable is imminent. Such an occasion would arise on an otherwise peaceful Monday afternoon this merry month of May. 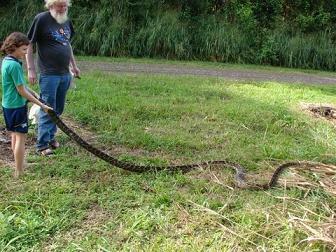 A call from a long term Bingil Bay resident comes in to explain that whilst he's not averse to serpents, this one is too big to manage and it's in his house! Now as this column has stated before HUGE pythons are standard whispering fare, yet none of these Monsters ever stretch the tape beyond a half grown 3 or 4 metres. That is, until today! My first inclination of the girth of this big fella is prior to sighting it when the homeowner suggests the whisperer's bag may be too small to hold its intended contents. 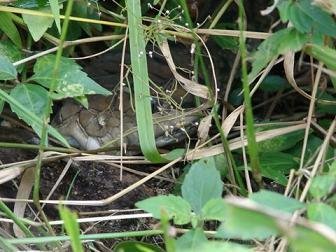 A quick glance reveals a large snake, well in excess of 4M but still coiled and so impossible to accurately measure. A 5 minute battle ensues with the cunning beast utilising every available timber joist it can wrap itself around to avoid the indignity of capture. After this lengthy wrestling session and with its head firmly grasped some idea of its size can be more reliably guessed closer to 6m or 20 feet in the old money! The animal also has an ugly scar on its back, a portion of which appearing to be open so a course of antibiotic cream is decided upon prior to release. The bathroom scales reveal 41kg of serpent! Truly in the realm of HUGE! A release including application of said salve is settled via a phone call or 2 and the treatment is swiftly administered, fingers crossed the while that an Iodine application won't sting it into anything aggro! This specimen is certainly the biggest snake the whisperer has had the good fortune to meet in Mission Beach, certainly itself a long time resident of perhaps 20 years or so. To reach such a size does involve a growth spurt or 3! Clearly we still have some genuinely HUGE pythons living with us, sharing our space cooperatively, living out their lives impressively and acting as large snakes will placidly. Whispering will rarely be the same but it's frankly doubtful whether one this size will come my way again! Another week in the never dull life of a snake whisperer has come and slithered by! A week of Shakespearian proportions in that it presented much ado about absolutely nothing! First up an evening call that initially seemed to be snake bound as it came from a gentleman who was operating an accommodation outlet and one of his female guests had been deeply disturbed! Distressed damsels are of course a whisperer specialty and so until the tale unfolded he was positively raring to go! It appeared this lady had visited the smallest room in the house and therein discovered not a snake, but a fearsome Green Tree Frog, furtively hiding beneath the lip of the bowl, doubtless with evil intent. The lady saw the terrifying creature, screamed, then insisted upon its prompt removal by management. Tragically management were finding difficulties in complying and hence the SOS call to the whisperer, clearly in the mistaken belief that anyone capable of dealing with serpents could also provide advice regarding roguish frogs. Flushing was suggested and the whisperer stayed at home. The next call was a latish one and on a Saturday night, finding the whisperer in a state of mild intoxication, having celebrated a grand footy victory during the course of the afternoon. The voice at the other end of the line was insistent, assuring of a large Python threatening the family canine. Thus the designated driver was roused from her slumbers. Upon arrival at the venue we were greeted with throaty barks from a seriously large canine and the whisperer thought that this must indeed be a HUGE python to challenge something of such dimensions, a thought reinforced when the lady of the house refused entry to the room where the felon lay in wait! Her husband was locked away safely upstairs! Terror dominated the household! A monster was at large! Receiving explicit instructions as to its whereabouts, snakes and ladders again came into play with the whisperer boldly ascending to the third rung before locating a 90cm Brown tree snake resting peacefully on a splintery ceiling joist! This fearsome, Rottweiler threatening ogre was swiftly bagged amidst subdued laughter and the sleepy designated driver permitted to travel the few kms home, back to bed, there to contemplate Much Ado About Nothing! Another Sunday complete with a splendid balance of comedy, pathos and a late night surgical call for good measure! Sunday begins with an SOS from Sth. Mission from a chap who explains he has both a snake in the loo and a very dodgy stomach resulting from an encounter with some reheated lasagne. Clearly this is not an occasion where a snake in the loo can be ignored or left to go away of its own accord. The Whisperer is quickly there, complete with snakewagon and new apprentice, on her first ever call out and bubbling with excitement! A ladder is required and so once again the old game of snakes & ladders is played out with the smallest room’s inhabitant being swiftly bagged, despite the new apprentice dropping it before the serpent has been secured; another apprentice, another failure. The homeowner explains his predicament as we listen and try to restrain laughter – his wife is away and had left him a massive lasagne, which he has partially eaten, refrozen, rethawed, partially eaten again, refrozen, rethawed and partially eaten a third time before offering the remains to his cattle dog. When the dog refuses to eat it he suspects trouble and his gut soon confirms the worst. 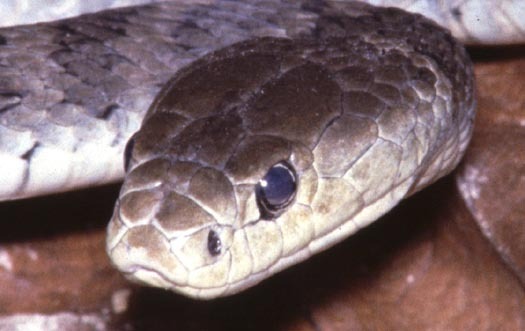 The discovery of a 1.5M Brown Tree Snake in his sanctum does not alleviate the problem. Later, much later, and indeed post bedtime, the phone rings again with an Amethystine Python which has devoured a hapless kitten – not an unusual event but an unfortunate choice for the foolish snake as it’s also swallowed metres of synthetic mosquito netting and a couple of brass rings used to tie the netting! Adding to the problem is that said netting remains attached to the ceiling and when the whisperer arrives the snake is already partially suspended. Only one course of action is possible given the damage the brass rings could cause; this involves relieving the Python of all three encumbrances, one very flattened kitten, a quantity of netting and several brass rings. The operation undertaken with surgical precision both Python and dead kit are separately bagged, the former for immediate release, the latter for immediate burial. The Whisperer notes a certain but distinctively unpleasant odour permeating his every pore following the disinterment of the creatures’ meal, so a shower and good soap up are called for as midnight approaches! Another Sunday passes, what will Monday bring? A whisperer's work is never dull! A recent out of town call was from a sensible sounding woman with a large – note, not HUGE, snake lurking about the house and her concerns are, she explains carefully, for the family pets. A price negotiated, the snakewagon is astir and the Whisperer on the road. Arriving at a pleasantly situated country cottage I’m greeted by the man of the house, a titan of a bloke! At least 6’6" in the old money, and of similar girth, in fact bearing arms that look capable of being milled and also covered in tatts! The Whisperer additionally notes the massive Harley or some such parked in the garage and wonders why on earth he’s been summoned when Hercules is so obviously on hand. An answer is not long forthcoming. A sizeable Brown Tree Snake is pointed out resting cosily in the woodwork at the rear of the house and Hercules immediately offers the use of a ladder before vanishing inside to join his spouse and the aforementioned pets, audible whimpering. The Whisperer sizes the situation up, determines that the bottom two rungs of the ladder will suffice, scales them effortlessly and grasps the intruder by the tail. It allows itself to be removed from its snoozing place with minimal resistance and then decides it doesn’t altogether fancy being placed into a bag, continually thwarting every attempt by climbing back up its own body to ensure its head is unbagged. A tarantella on the back lawn follows with the Whisperer avoiding the open mouthed aggro of a now angry 2.1M Brown Tree whilst continuing to coax it into a warm, friendly sack. Meanwhile a running commentary is being provided inside – "He hasn’t got it yet – keep the door locked!" Finally, triumphantly, the serpent is installed in its short term housing and a secure knot hastily tied. Again from indoors, "It’s OK now, we can go out" whereupon Hercules and his personal Amazon companion emerge in the company of a Jack Russell, the last named vigorously sniffing the contents of the whisperers’ bound sack. "Mate, we just go to water when we see these things" is his proffered explanation of this extraordinary display of faint-heartedness in the face of ophidian adversity. Money changes hands; the grumpy inhabitant of the bag is released, amidst a show of spitting and rearing at the Whisperer, an admonishment perhaps in outrage from being removed from a lifetime sinecure of devouring Indian Myna eggs and chicks, admittedly a useful purpose, and Hercules and the Amazon are left to contemplate their newfound life in the Tropics. The Cairns Post have clearly been having a slow news week with their extraordinary story about a 5M (sic) Python devouring a family Chihuahua. 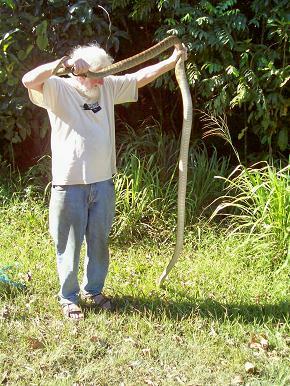 Now judging by the photos published the serpent in question was significantly less than the reported size, particularly as in the Whisperer's experience serpent bellies can be equated fairly comfortably to their overall length, and as this one seemed to have a swollen tummy with a small dog inside its length was perhaps closer to 4M than the quoted 5. Secondly the CP played up on the question of any danger to kiddies as it should be mentioned that there are NO recorded instances of an Australian Python taking a child, let alone a 5YO! It may be worth recording that a doe wallaby weighs considerably less than the average 1YO, making it highly unlikely that anything (a) that hefty and (b) that loud, would be in the least bit attractive to a hungry reptile. The largest serpent the Whisperer has had direct dealing with in MB was a measured 5.2M Amethystine collected in Wongaling with a chook cosily inside it! The bump was barely visible and one felt the bird was little more than a between meal snack for the serpent. One point of warning however is that if one chooses to keep small pets, be they chickens, pussycats or small dogs, one is offering the equivalent of a drive thru take away food store to larger Pythons. Native fauna remains on alert through generations of evolution to the presence of these big fellers whereas family pets are clearly less aware of the dangers they face when they pop out for a regulation pee or whatever! Heat sensors,which all snakes possess, enables them to watch potential prey, learn their habits, and finally BINGO! Pets are delightful things but in the Tropics we must remember they're also edible if they're small enough! A question I’m often asked is "Have you ever been bitten?" Now, as all the handlers I’ve worked with or met over the years know and know well, the first bite is part of the initiation into handling, the second or third begins to lead one to the finer art of whispering! Snakebite is something akin to divorce, distressing, painful, yet a learning experience along life’s long journey, a sharp lesson which, if not heeded, will lead to more serious problems in the future. My first bite was from a Death Adder which fortunately was depleted of venom as I happened to be milking it at the time it chose it sink its not inconsiderable fangs into a fleshy part of my hand. The most embarrassing aspect of this incident was that nearly 200 people were watching the milking demonstration in a sense of awe! This was a moment of unflinching terror but fortunately the proprietor of the establishment was alert to the situation and seamlessly removed the offender from my fingers and continued the show whilst Muggins was rushed away by ambulance! In hospital it was discovered that like 10% or so of the population I was allergic to antivenene and thus ended up on a heart lung machine, NOT from the Adder lovebite but the serum they’d pumped unnecessarily into my veins. The next few nips were from less venomous members of the tribe but all served to remind one that prevention is always preferable to cure, particularly if cure is more likely to be lethal! This in turn leads to a gathering of wisdom which mostly ensures I simply don’t get bitten these days, unless it’s by a cheeky Python on the cuff of my jeans. Python bites today are of more concern as their mouths tend to be receptacles of filth and bacteria, causing unpleasant infections which modern antibiotics appear relatively helpless to deal with satisfactorily. So we can reasonably infer that whispering has an element of danger attached to it which is perhaps why those of us who pursue such a career continue on our wicked ways – we unashamedly enjoy both the adrenalin and the beauties of nature……….. Just keep me away from the antivenene! Ah me O my, what a peaceful week in the life of a snake whisperer! Scarcely a serpent to handle has passed this way since the untimely events so pictorially recorded on the website! Yes, a few calls, but all of those deemed to require mentoring rather than physical relocation – "It’s not in the house?" "NO, it’s under a piece of tin in the garden" – "Every chance if you don’t need to move that piece of tin it’ll just go away" – "Are you sure?" – "Absolutely, not much to eat beneath a piece of tin!" – "Oh, I hadn’t thought of that! Thanks so much!" and the like – simple enough stuff and as EPA permits demand a high level of integrity regarding relocation such calls are usually dealt with in a similar manner. In fact my permit baldly states "You must be satisfied that the snake may cause personal harm or pose a threat to human health and wellbeing" In short, I’m only allowed to shift them if they’re stopping you get to the bathroom or the beer fridge! There is of course some bureaucratic flexibility within these constraints! Education remains the primary purpose of any sensible snake whisperer and as such I’d like to raise the fascinating issue of Jacobson’s Organ, a gland situated in the cheeks of all snakes. This is an organ which most mammals, including man, possess, but in our snakes has developed rather more than in other species, perhaps to compensate for other deficiencies such as loss of limbs etc. Jacobson’s Organ enables snakes to taste, transmitting information gathered via their tongues and deciphering it with astounding accuracy. 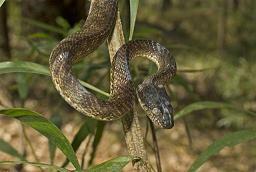 Thus snakes can detect fear through smell although they have no noses. It also plays a significant role in Infra Red vision, enabling snakes to see warmth, such as likely prey in the dark. Most importantly and only recently discovered is that this singular organ additionally advises snakes whether their prey is too big to comfortably swallow! In all, a remarkable organ, and one which doubtless NASA would dream of emulating synthetically for future space exploration! I leave the technocrats amongst my small band of readers to ponder the potential of such an engaging device! 12 - Courage is nothing! (A) Know thy reptile! 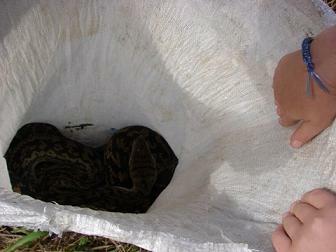 Identification is critical as all species behave differently and knowing just how a snake is likely to react can mean the difference between being bitten and comfortably loading the creature into a secure bag. 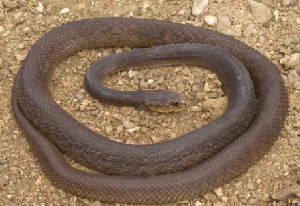 For example Brown Snakes will bite upon the least provocation but invariably display particular warning signs just prior to striking. A failure to recognise these display mechanisms can curtail a whispering career very quickly! (B) Love thy reptile! Handlers need to both be fond of and have full respect for the serpents they’re dealing with as any sense of fear or loathing will be picked up on by the animal as snakes are remarkably sensitive to human emotion – they taste it via their tongues. Confident and comfortable handling makes the snake easy with you as it reacts to your feelings towards it. These two points could be expounded on at some length but in essence provide the means whereby a Whisperer can live to a healthy age and continue operations without concerning themselves over the apparent lack of a VC for services to either the reptile community or the broad human community, many of whom are so frightened by our scaled friends. I often remind people that snakes don’t want to bite people as they can’t eat them and they’d much prefer to be simply left alone and set about their business of devouring rats, mice and yes, the occasional pet bird or pussycat. Some small species indeed favour a diet of termites, making them indispensable allies of mankind! So, if you ever think of killing a snake, remember just who you’re doing a favour for……. Ring the whisperer instead! It makes more sense. On occasions the whisper has to give way to something a touch louder and just once in a while, whispering becomes wrestling. Such an event occurred recently with a call to a home to the north of Mission to remove a Python, which was taking undue interest in the inevitable chooks. The snake was quietly coiled in a narrow space between the poultry pen and a tool shed, there it had a wonderful view of the roosting birds and presumably was ascertaining the easiest means of ingress and which fat, tasty bird would provide dinner! In all, a perfectly reasonable pastime for a serpent of some 2.8M. Sadly in disturbance of this idyll comes the Whisperer who is swiftly provided with a rake to coax said serpent from its viewing point, an action which singularly failed to please it! At this point I should clarify that only the handle end of the rake was utilised for relocation to a point where the snake could be grasped. Now perhaps readers could pause at this moment and reflect on their own feelings should they find themselves at a takeaway food store, contemplating an order from a Bain Marie filled with inviting offerings, when suddenly and without warning an alien creature begins poking them with a long wooden object, prior to grabbing their tail firmly and hauling them away with gusto! In short it came as no surprise to see the open mouthed, hissing approach taken by the Amethystine Python of this tale, even less surprise when the Whisperer watched as his jeans cuff was clamped on by two rows of needle sharp teeth. Allowing the snake its moment of displeasure and waiting for a release of the fangs seemed a lengthy process but in the fullness of time and understanding that snakes always let go eventually it’s head was shortly pinned by a hand and the offending poultry thief was duly bagged with some assistance from the bold, sky-diving property owner whilst his good lady snapped pictures of the unravelling evening capers. The bag well tied, Alex was popped into the back of the trusty snakewagon, an offer of a cold beer and perchance a chicken wing accepted, although the latter was consumed with a tinge of guilt knowing that an equally deserving member of the animal race had been denied such treats, but a release was imminent and soon enough completed, at a considerable distance from the nearest chicken coop! After several decades of snake whispering (the apprenticeship is lengthy!) one has many fond memories and is so often the case the best involve situations where reptiles were of secondary relevance. During the early 1990’s I had travelled to Iron Range on Cape York Peninsula on a seed collecting foray taking with me a Sicilian gent whom we will refer to as Ben (not his real name). Ben had excellent eyesight, remarkable powers of concentration whilst sitting in a passenger seat driving through rainforest – he could spot ripe seed at 50M, and was a generally cheerful, helpful sort of character. And so we arrived in the deep, dark rainforests that cloak this remarkable part of the Cape with high hopes for splendid results. We were not disappointed. It was, as I recall, the last day prior to returning south with our bounty that Ben turned up in camp with a revelation that he’d spotted some unusual looking fruits in a nearby tree. Slightly puzzled as he generally brought such items straight back I inquired as to where? He explained that they were fairly high up and that he may need a shoulder up to scale the tree. Impressed with Ben’s dedication to our cause I immediately set out. Finding the tree it turned out to be a desirable species of which we had found none thus far so I readily consented to his suggestion of a lift up to the lower branches. He achieved this easily, then continued to clamber up to the first cluster of bright red fruits which he cheerfully plucked and sent down to me on terra firma. At this point Ben called out that there were others higher and that he could reach them with some small effort – I willed him ever upwards! At this point Ben had determined to use a enormous Birds Nest Fern as a stabilising point in his ascent, grasping the lower fronds with both hands. Tragically said fern was also providing a snoozing corner for a genuinely large Amethystine Python, a sleeping serpent which was disturbed into surprised wakefulness by Ben’s disturbance! The snake tumbled and landed safely spread across Ben’s face & shoulders, an event which clearly upset the creature sufficiently for it to release the long stored content of its bowels, mostly targeting Ben’s T-shirt and chest. Snake excrement is unpleasant stuff which cannot be washed off in a single shower and so we endured a long and noisome trip home, complete with seed of many species and leaving one relieved, yet startled reptile still pondering the vagaries of humankind. On what has been a quiet week’s whispering a couple of moments have stood out! Firstly came the call from the young couple, newly arrived here in the Wet tropics and perhaps still enjoying the idyllic dream of living self-sufficiently, close to nature and suchlike; all of it admirable! There was a Python in their chook shed they explained and upon arrival it became evident that said Python had recently enjoyed a substantial meal. I commented on the loss of poultry to be informed that they hadn’t bought any chooks as yet. It was at this moment that the whisperers’ role changed dramatically! The young lady had smiled at my blundered reference to a chook and quietly asked, "They don’t eat cats do they?" My reply may have too affirmative if her facial expression were any guide. "Our cat went missing last night" she told me, eyes shifting rapidly from me to the bag with well fed Monty inside. "Pythons love cats" I reiterated. "Could that be Cossie inside it?" she asked, tears welling. Her next question floored me. "Could he still be alive?" "NO" was my firm response. Her teary collapse into her waiting husband’s arms was truly touching and definitely preferable to any request to undertake a post mortem on a live Python to determine the subject of its last meal. Some visits are genuinely sad. On a less tragic note was the call from Tully reporting a small TAIPAN in a cutlery drawer; this of course was a small Brown Tree Snake but my suggestion that it might just have been looking for a knife and fork to eat a meal daintily was received with less than grace. "That’s silly" the woman forcefully told me, "Snakes don’t have hands!" This display of deep serpentine anatomical knowledge naturally dumbfounded the Whisperer but left a delightful story to pass on to all good and gentle readers of this occasional column. The task of snake whispering in a small town isn’t always as easy as some folk may consider. Obviously knowledge of snakes and their behaviour is essential as is having the appropriate equipment. The other aspect of successful whispering is having a reliable sidekick! This third consideration is often the hardest part of the exercise! Now that my young apprentice, Ryland, has resumed his studies at boarding school and Shane, the reptile loving Irish backpacker has continued his travels and is currently in Nepal, the Whisperer is again left with only his splendid wife to offer occasional assistance. Now help isn’t always needed but imagine grappling with a 4M Python with one hand and endeavouring to place it into the bag you’re holding with the other and a picture begins to develop. Snakes, particularly Pythons, are very adept at coiling themselves, and a largish one that is wrapped several times around one’s arm, slowly stopping all possibility of circulation, is not a comfortable issue to deal with. Hence the requirement for assistance, mostly holding the bag open while one manages the creature with two hands. Offers of assistance are frequent enough but offers don’t necessarily translate into useful aid as events such as serious attempts at the world record for reverse long jumping whilst holding a bag open have served to prove! One is reluctant to be critical of well meaning offers to help but with instances such as the above fresh in the Whisperers’ mindset, more experienced or confident assistance is always welcome. On that specific occasion I was dealing with a 3.8M Python in a less than cooperative frame of mind which I had gripped firmly by both head and tail, carefully uncoiled from my rapidly turning blue arm and was about to deposit into the held open bag when the new chum holding it flung himself from a quivering start and nearly cleared two parked cars, all in reverse! Fortunately his acrobatic performance was accompanied by dropping said bag, thus enabling a swift ingress for the culprit. It ain’t always that easy folks! In short, anyone out there in reader land who would like to learn a few handling skills please contact Adrian on 40687531. The pay is terrible but the job’s rewarding and the hours most variable! Would you know quite what to do? Says that the Whisperer's around! Or Tigers on your tail? 'Cos it’s said he’ll seldom fail. And he’ll do it in a snap! Insofar as he can reach! As some others around this town! Call Adrian on 4068 7531. When is a slithering, scaly beast not a snake? Simple! When it’s a Legless Lizard! There are several different species of these entirely harmless creatures around the beach, both along the coastal fringe and also in the rainforest. It’s been observed that legless lizards are snakes designed by a committee, an opinion the Whisperer is entirely at odds with as most committees I’ve come into contact with have their share of venomous, serpentine types. The other defining factor is that all snakes have forked tongues whereas legless lizards have solid tongues, a further, and one would think significant point in demolishing the committee argument! So apart from the small anatomical differences how can a casual observer differentiate between the two groups? Not so simple this time as legless lizards exhibit numerous snake like traits such as rearing and feigning to strike if disturbed. Such displays are of course, merely bluff designed to create doubt and fear in the mind of any would be predator. Perhaps in the bluffing game we may have truly sourced the origin of the committee design myth? I shall leave this consideration to my more learned bureaucratic colleagues. The largest of the locally occurring species is Pygopus, the Scaly Foot, a friendly little chap resembling an immature Eastern Brown and growing to maybe a maximum of 80cms – in short, quite short! On the other hand smallness should never be regarded as safety as an 80cm Small-eyed snake is perfectly capable of ending a human lifespan. In a word, when in doubt ring the Whisperer – unless he’s out on a TV shoot or attending a book launch, he’ll generally be available to identify, remove and relocate, to do anything except damage our reptilian friends, whether they be regarded as friend of foe. What does it take to draw A Current Affair from their lofty Channel boardrooms to the wilds of Mission beach? It seems little more than a good human interest story of the whisperer and his remarkable 14 year-old apprentice. This past Monday the crew flew in met, both the remarkable Ryland and the whisperer himself, who had of course advised many a townsperson to call in the event of anything slithering around their houses; the promise of a minutes television stardom left dangling in their eyes. The first call was not long in coming – a small Python, very conveniently located within walking distance of the whisperers’ humble abode. This one was duly collected, filmed, interviewed at length (about 1.2M) and released in full tree climbing mode. Call 2 was more exciting, being a HUGE python invading a lounge room and creating a reign of terror therein. Again the intrepid party set out and rescued both beast and the inhabitants of the house. For a carpet it was a good size, all of 3.6M, splendidly healthy, and exceptionally docile given the unwanted attention it was being subjected to. As the night grew somewhat older and just as filming the release was nearing its end another call registered, again within walking distance, and this time a ‘snakes and ladders’ number, cosily coiled in the rafters of a timber cottage deep in the MB hinterland. Carpet #3 was also bagged, measured to a respectable 2.3M, advised to take a course in temper management, and thence released back into the wilds of the hills. By this stage the clock hands had almost reached a disreputable 1am, well past the whisperer’s normal bedtime, let alone his youthful sidekick! For those local souls who manage reception on 9, try on Thursday and Friday nights for some wonderful nightime footage of our serpentine fellow travellers – in the meantime; please don’t call the whisperer until he’s caught up on some much needed slumber! Summer is snake time in the Tropics. Beware! Snake whispering has some lighter moments and even occasions of great humour. These are essential to maintain sanity! One such event was the SOS phone call from Mission Beach Tourism breathlessly explaining that a large snake was lying across the pathway near their front entrance and could the Whisperer rush down as one traumatised visitor had already suffered the misfortune of standing on the poor beast. Naturally one went to the scene of the crime swiftly and there found an interesting collection of people, all standing a respectful distance from the lurking reptile! A close approach quickly revealed the telltale sign of blood slowly flowing from the snakes mouth, suggesting it had been recently run over, struggled across the road to find some shade, and there passed into reptile heaven. Another entertaining (although not for some!) incident occurred late last year when a Sunday morning caller was distressed to learn that the Whisperer was in need of transport. The caller was given (a) directions and (b) advice not to use a broom in an attempt at DIY. A second call followed 15 minutes later and a third an hour and a half beyond again. The third more urgent as it was explained that the caller would come as soon as the ambulance arrived for his wife! The gent in question (who shall remain nameless) had persisted with the straw broom technique and in a brilliant flash of inspiration had organised his wife to shoo the Python out with a broom handle! Irritated by the attention of the straw broom the Python simply ascended the handle and sunk its 72 recurved teeth into the poor woman’s wrist! Her screams alerted her husband to the immediate and unfortunate action of tugging hard at the offenders tail, thus tearing even more skin, sinew, etc. from his good woman’s arm! Many snakes locally are currently undergoing the tedious business of sloughing their old skins, an event which takes place annually in mature snakes, more often in juveniles to accommodate their rapid rate of growth. The phrase ‘drop the scales from his eyes’ comes directly from old serpent lore as snakes simply don’t see well when their old skin gets milky and a poor sighted snake is usually a hungry and thus cranky one! I endured such a beast on one occasion in Bingil Bay, unfortunately an Eastern Brown which had found its way into a small back room, well populated with furniture and other belongings and fortuitously containing an excellent cupboard for an old skin to be scraped off. Tragically, before this sensible operation could be carried out, the homeowner discovered the reptile and phoned the snake whisperer. Anticipating the usual Brown Tree I arrived barefooted and sans stick, a serious error in judgement which was soon revealed when a quick inspection revealed the real culprit to be someone potentially lethal! Following an adrenalin pumping 20 minute battle through shoes, the stereo equipment etc, etc, the unwelcome visitor was subdued and bagged, principally with the aid of a convenient Balinese wall hanging borrowed from the more expansive lounge room for the purpose of head pinning! The beast was in no mood to be disturbed, let alone captured and relocated and the snake whisperer relieved that its poor sight had ensured that both punitive strikes had fallen short of their intended mark. Eastern Browns rarely enter houses with perhaps the need to shed the only purpose that may occasionally drive one in. This particular creature, upon release, was still spitting and angry and one couldn’t but hope that few enough tourists were walking in its fresh home base, distant enough from Bingil Bay. It begins with a call from Paradise Winery reporting an apparently thirsty visitor maybe seeking a tipple to wash down its likely last meal of Metallic Starling chicks; Some hours later another call from the same venue for a slightly larger specimen, but presumably with similar intentions. These two calls, both Brown Trees, raised the problem that if the serpents were departing the garden of Paradise and entering the showroom where might this leave us all? I pose this question to the theologians amongst our community. A late night call from Tully for a Northern Tree snake, mischievously preventing the owners’ wife from entering the bathroom, rounded off the week's beginning before a morning call from Carmoo for a sub adult Carpet Python relaxing in someone’s lounge room and probably enjoying the latest David Attenborough. This photogenic little beauty was immortalised by Liz Gallie’s camera. Thursday morning broke with a Reid Rd rental property manager insisting that, yes, another HUGE python be removed post haste. Another Carpet but measuring up at 3.2 M so well within the normal range of the species, short of HUGE, and as usual liberated a reasonable distance away, at least far enough not to scare the soon incoming tourists: mustn’t frighten the kiddies! Friday almost passes without incident that is until 10:30 pm when the phone disturbs the whisperer’ serpentine slumber. A brown tree snake almost in Tully, on this occasion the voice raises a few decibels and the whisperer shifts into a stern counselling session. Leave a door or two open, ignore the snake, it WILL go away. A Sat. morning check reveals it HAS gone away. What, one asks over breakfast; will the balance of the weekend hold? Snakes are beautiful creatures which sadly since the Old Testament have endured a bad press! 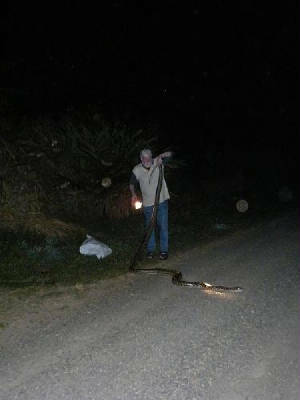 As Mission Beach’s only licensed snake catcher Adrian Walker gets a lot of callouts, at all times of the night and day! The current records are - just after midnight and 4:45 am respectively. Snake whisperers are a bit like plumbers, electricians and doctors, always on call and expected to drop everything and in shining armour ride their steeds out to rescue those in distress! There are two common calls, one being for a HUGE python which usually translates at anywhere between 3 & 4 metres in length, not HUGE by Amethystine Python standards. In fact the biggest I’ve personally handled was well above 7m. 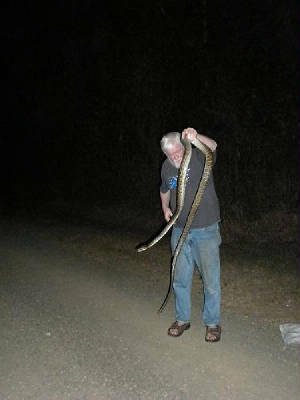 The other standard caller reports a large Taipan - a rare snake locally and one which almost never enters houses. Invariably these metamorphose miraculously into Brown Tree Snakes when Adrian arrives. Other callers also confuse the common Brown Tree with the more dangerous Eastern Brown, a snake which seldom climbs, and then poorly. One clear pattern has emerged from MB snake whispering – which is that a lot of locals are terrified of snakes and a lot of locals who keep chickens or cats simply don’t know that Pythons in particular love to eat these dainty morsels and thus treat such houses as takeaway tucker stops. The Brown Tree Snake is far and away the most house friendly visitor you’re likely to encounter and as they’re relatively harmless a simple enough remedy is to leave a door or two open if you have one inside and be assured it will find its way out by morning.